Download "Personal Injuries Happen. Justice Is Sought. Special Needs Must Be Addressed. Special Needs Require Special Settlement Planning"
2 Why Use the Special Needs Law Firm? In most personal injury cases, the path to a settlement or verdict can be a very difficult process. Once resolution has been achieved, detailed planning is needed to protect the settlement proceeds. There are many complex planning issues to consider when a personal injury case settles to maximize the recovery. Medicaid, Medicare and ERISA liens have to be resolved. Trusts often times have to be created. A Special Needs Trust or Medicare Set Aside trust might be necessary. Tax and estate planning may be necessary. All very difficult issues to deal with for even the most sophisticated lawyers and injury victims. To make matters more complicated, many injury victims today receive public benefits such as Medicaid and Medicare which can be lost without proper planning. Losing public benefits can cause rapid dissipation of the settlement proceeds. In addition, statistics show ninety percent of injury victims have nothing left of their settlement proceeds within five years. Proper planning is critical to prevent the loss of the money while preserving public benefit eligibility and maximizing the recovery. That is the exclusive focus of our practice. We help clients deal with the intersection of settlement planning, settlement taxation, public benefit preservation and lien resolution. This is our practice and it is called Special Needs Settlement Planning. With our help, lawyers and injury victims alike can navigate more efficiently through these difficult issues. We can create settlement preservation strategies to ensure the recovery is maximized and protected. Don t underestimate the importance of hiring a lawyer who can help guide the parties through these complexities and implement a sound plan for a personal injury settlement. We provide expert settlement planning services because special needs require special settlement planning. 3 What is Special Needs Settlement Planning? 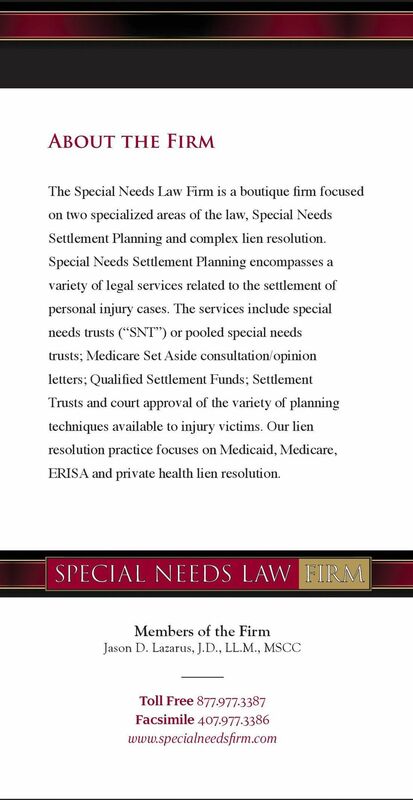 Special Needs Settlement Planning is a unique niche practice focusing on the services a trial lawyer and injury victim may need at settlement of a complex case. It includes traditional advisement regarding needs based public benefit programs and the techniques to protect eligibility for those programs using special needs trusts ( SNT ). However, it also involves problem solving techniques for the increasingly complex issues faced at settlement. This includes advisement regarding compliance with the Medicare Secondary Payer Act ( MSP ) and the potential creation of a Medicare Set Aside ( MSA ). Settlement planning issues are also explored including allocation of funds between different settlement vehicles; creation of settlement trusts and advisement regarding compliance with state and federal law regarding payee and beneficiary designations. Finally, it entails assisting with the court approval process and obtaining court approval of trusts established at settlement. The settlement of an injury case oftentimes leads to complex lien resolution issues which is another practice area for the firm. What is Lien Resolution? We offer comprehensive Medicare, Medicaid, ERISA and private health insurance lien resolution services for trial attorneys. This service can decrease a trial lawyer s overhead and increase cash flow for your law firm, which is not getting compensated to negotiate or reduce the lien. You can also remove professional liability for lien resolution and in the process increase client satisfaction. We identify the controlling law (whether state, federal, or a combination) and jurisdiction. We scrutinize the provider s grounds for asserting the lien or subrogation right, whether it arises out of contract, statute, or common law. We determine the limitations on the provider s rights to lien, subrogation, and/or reimbursement. We resolve the lien on your behalf and in the best interests of the claimant. 4 Practice Areas: Special Needs Settlement Planning Public Benefit Advisement: We assist trial lawyers in identifying public assistance programs and eligibility requirements for those programs which may be impacted by settlement. We also identify techniques to protect eligibility for programs the injury victim needs post settlement. Sometimes there are other programs that may be beneficial to an injury victim s post settlement life and we can assist in identifying such programs. Special Needs Trusts: A special needs trust is a trust created pursuant to federal law whose assets don t count for purposes of needs based public benefit programs such as SSI/Medicaid. We specialize in drafting these trusts to meet the specific needs of the injury victim and his or her settlement. We also assist with establishment of a pooled special needs trust subaccount with one of the many pooled trusts in existence. Medicare Set Aside Advisement: Compliance with the Medicare Secondary Payer Act at settlement can be a daunting task. The implementation of a Medicare Set Aside may be necessary in certain cases to comply with the MSP. We provide guidance and recommendations to help the trial lawyer navigate this complex area of the law. We also prepare formal submission packages to CMS for MSA approval. In some cases clients are dual eligible (Medicare & Medicaid) in which case a hybrid SNT/MSA must be created. We have the requisite expertise to draft these hybrid trusts. Settlement Planning Advisement: Navigating the complex issues at settlement regarding settlement options and funding trusts can be extremely complicated in today s settlement landscape. We provide advice regarding allocation issues between different settlement options along with identification of issues regarding state/federal law requirements for payee as well as beneficiary designations. Settlement Trusts: Settlement trusts are an excellent tool for managing a client s settlement when public benefits are not an issue. These trusts are useful in many cases to avoid rapid dissipation of the settlement or for wealth management/estate tax reasons. We draft settlement trusts specifically tailored for an injury victims needs. Selection/Identification of Trustee: Oftentimes a professional trustee is utilized for special needs trusts, Medicare Set Asides and settlement related trusts. 5 Identification of an appropriate fiduciary to manage a trust beneficiary s needs is critical. We make sure the trustee, if it is a professional trustee, is suitable to the type of trust being created. Settlement Approval Assistance/Consultation: The implementation of certain trusts necessitates court approval by the court with appropriate jurisdiction. We advise regarding the need for court approval of certain trusts and work in conjunction with a guardianship/ probate lawyer to get proper approval of the settlement. Qualified Settlement Funds ( QSF ): Our firm establishes qualified settlement funds and provides trustee services for the fund. A qualified settlement fund is a trust that is a great settlement planning tool. It allows a trial lawyer to settle a case involving complex planning issues as if it were a cash settlement. The funds are sent from the defendant to the trust which acts as a temporary holding tank for the funds without violating constrictive receipt and available resource rules for needs based public benefits. QSFs are established pursuant to 468B of the Internal Revenue Code. Liens Negotiation: Our firm reviews applicable plan language to determine proper techniques to resolve a private health care or ERISA lien. We also evaluate Medicaid liens and Medicare conditional payments to determine the proper amounts due. We then directly negotiate with the lien holder, with the real threat of litigation, to obtain a positive reduction of the lien amount. Certain plans will prevent any reduction of a lien but many plans do not have proper language in the plan which can result in no lien at all. Medicaid Ahlborn Reductions: The landmark Ahlborn decision has led to litigation over the ability of Medicaid to assert its full lien amount in cases where the recovery for past medicals is limited. We assist with securing an Ahlborn reduction and litigating the issue with Medicaid if need be. IN THE MAZE OF CONFUSION, THERE IS A SOLUTION. SETTLEMENT PRESERVATION TRUST WHAT IS IT AND WHEN SHOULD I USE IT? By: Thomas D. Begley, Jr. Articles Trust and Estate Law Using Qualified Settlement Funds in Personal Injury Settlements for Protected Persons by Sarah L.
Banking on Justice. Attorney. PLaintiff Deposits. Deposits. PLaintiff. How to run your law firm like a business. A Primer. on Special Needs Trusts JOHN STAUNTON, P.A. A Professional Association. Copyright 2008. John Staunton, P.A. My Attorney What A Personal Injury Lawyer Can Do For You By Christopher M. Davis, Attorney at Law Davis Law Group, P.S. 2101 Fourth Avenue Suite 630 Seattle, WA 98121 206-727-4000 Davis Law Group, P.S. Arkansas Department of Health & Human Services v. Ahlborn: Sea Change or Status Quo for Resolution of Medicaid Liens? SCHOLARLY ARTICLE What Every Attorney Must Know About Medicare Reporting and Reimbursement By Toni J. Ellington In 2007, Congress passed Section 111 to the Medicare, Medicaid and SCHIP Extension Act (MMSEA). The Lien Resource. Why Outsource Medical Liens & Healthcare Reimbursement? USING A SUPPLEMENTAL NEEDS TRUST IN SPECIAL EDUCATION LITIGATION BY ADRIENNE ARKONTAKY, ESQ. AND ROBERT P. MASCALI, ESQ. PART III MEDICAID LIEN RECOVERY. 1) From the estate of the Medicaid recipient.